Seaport of southern France with about 5,000 Jews in a population (1896) of 420,300. It had a Jewish colony as early as the fifth century, and in 567 a number of exiles from Clermont, Auvergne, sought refuge there from the intolerance of Bishop Avitus. Pope Gregory intervened in their behalf in 591, reproaching Theodore, Bishop of Marseilles, for having attempted to convert them by force and not by suasion. Benjamin of Tudela says ("Itinerary," i.6) that when he passed through the city, about 1165, the Jewish community numbered 300 members, who worshiped in two synagogues. In the thirteenth century the Jews carried on an extensive commerce and had considerable relations with the East. While they are called "citizens of Marseilles" ("cives Massiliæ"), as appears from the compact made in 1219 between the city and the bishop in regard to the municipal franchises, and from the agreement between the inhabitants of Marseilles and the Duke of Avignon in 1257, this does not seem to denote that they had equal rights with their Christian fellow citizens. Their condition, which seems to have been favorable during the earlier parts of the Middle Ages, underwent a change in 1262, when the city was obliged to capitulate in consequence of an insurrection against the Duke of Anjou, Count of Provence, to whom the Jews were surrendered as property which he might tax at pleasure. The count, on the other hand, was well disposed toward the Jews, and in March, 1276, issued a severe edict against the inquisitors who had compelled them to wear a badge of greater size than the one worn by them since the Lateran Council of 1215, and extorted large sums from them under the pretext of fines. Still, although theoretically the Jews were citizens, certain passages of the laws make it clear that they were not treated as such. After the age of seven they were obliged to have on their breasts a disk of some colored material, as large as the hand, while married Jewesses were required to wear special veils, "orales," under penalty of a fine of fivesous. As in other cities of the Provence, the Jews of Marseilles were forbidden to testify against Christians if their testimony was challenged, or to work on Sundays and Christian holy days. They were likewise prohibited from going to the baths more than once a week, from journeying to Alexandria, or from embarking in groups of more than four on the same ship. Jewish passengers on a vessel, moreover, were forced to refrain from meat on days when the Christian passengers abstained. Toward the end of the thirteenth century a Jew living near the episcopal palace arranged some Purim games which the Christians regarded as a mockery of their religion, and the bishop, making the whole community responsible, imposed a heavy fine upon it (Ibn Adret, Responsa, iii. 389). The fourteenth century was a golden age for the Jews, for they were placed under the absolute protection of the municipality. 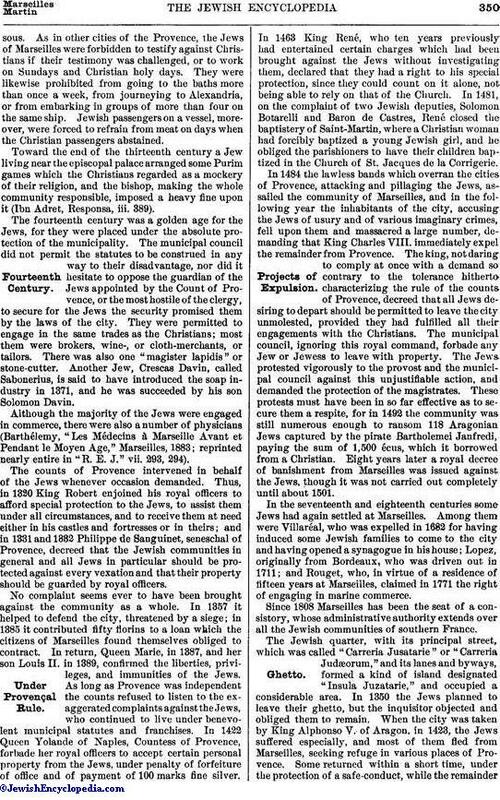 The municipal council did not permit the statutes to be construed in any way to their disadvantage, nor did it hesitate to oppose the guardian of the Jews appointed by the Count of Provence, or the most hostile of the clergy, to secure for the Jews the security promised them by the laws of the city. They were permitted to engage in the same trades as the Christians; most them were brokers, wine-, or cloth-merchants, or tailors. There was also one "magister lapidis" or stone-cutter. Another Jew, Crescas Davin, called Sabonerius, is said to have introduced the soap industry in 1371, and he was succeeded by his son Solomon Davin. 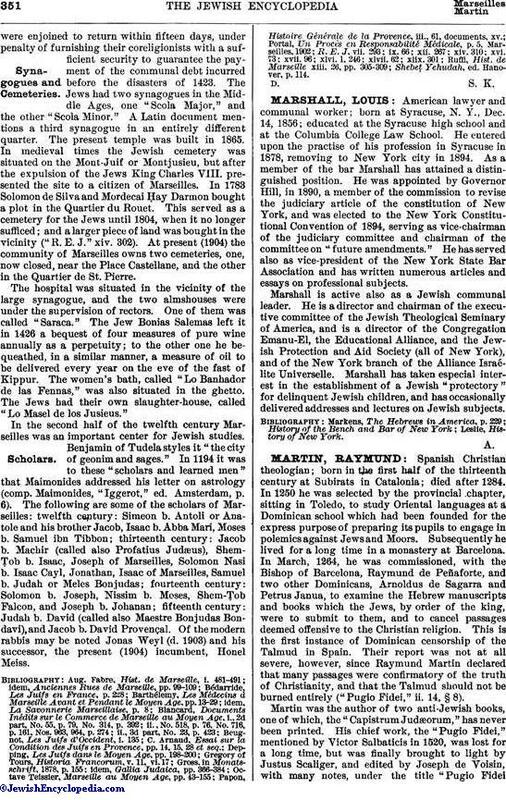 Although the majority of the Jews were engaged in commerce, there were also a number of physicians (Barthélemy, "Les Médecins à Marseille Avant et Pendant le Moyen Age," Marseilles, 1883; reprinted nearly entire in "R. E. J." vii. 293, 294). The counts of Provence intervened in behalf of the Jews whenever occasion demanded. Thus, in 1320 King Robert enjoined his royal officers to afford special protection to the Jews, to assist them under all circumstances, and to receive them at need either in his castles and fortresses or in theirs; and in 1331 and 1332 Philippe de Sanguinet, seneschal of Provence, decreed that the Jewish communities in general and all Jews in particular should be protected against every vexation and that their property should be guarded by royal officers. No complaint seems ever to have been brought against the community as a whole. In 1357 it helped to defend the city, threatened by a siege; in 1385 it contributed fifty florins to a loan which the citizens of Marseilles found themselves obliged to contract. In return, Queen Marie, in 1387, and her son Louis II. in 1389, confirmed the liberties, privileges, and immunities of the Jews. As long as Provence was independent the counts refused to listen to the exaggerated complaints against the Jews, who continued to live under benevolent municipal statutes and franchises. In 1422 Queen Yolande of Naples, Countess of Provence, forbade her royal officers to accept certain personal property from the Jews, under penalty of forfeiture of office and of payment of 100 marks fine silver. In 1463 King René, who ten years previously had entertained certain charges which had been brought against the Jews without investigating them, declared that they had a right to his special protection, since they could count on it alone, not being able to rely on that of the Church. In 1481, on the complaint of two Jewish deputies, Solomon Botarelli and Baron de Castres, René closed the baptistery of Saint-Martin, where a Christian woman had forcibly baptized a young Jewish girl, and he obliged the parishioners to have their children baptized in the Church of St. Jacques de la Corrigerie. In 1484 the lawless bands which overran the cities of Provence, attacking and pillaging the Jews, assailed the community of Marseilles, and in the following year the inhabitants of the city, accusing the Jews of usury and of various imaginary crimes, fell upon them and massacred a large number, demanding that King Charles VIII. immediately expel the remainder from Provence. The king, not daring to comply at once with a demand so contrary to the tolerance hitherto characterizing the rule of the counts of Provence, decreed that all Jews desiring to depart should be permitted to leave the city unmolested, provided they had fulfilled all their engagements with the Christians. The municipal council, ignoring this royal command, forbade any Jew or Jewess to leave with property. The Jews protested vigorously to the provost and the municipal council against this unjustifiable action, and demanded the protection of the magistrates. These protests must have been in so far effective as to secure them a respite, for in 1492 the community was still numerous enough to ransom 118 Aragonian Jews captured by the pirate Bartholemei Janfredi, paying the sum of 1,500 écus, which it borrowed from a Christian. Eight years later a royal decree of banishment from Marseilles was issued against the Jews, though it was not carried out completely until about 1501. In the seventeenth and eighteenth centuries some Jews had again settled at Marseilles. Among them were Villaréal, who was expelled in 1682 for having induced some Jewish families to come to the city and having opened a synagogue in his house; Lopez, originally from Bordeaux, who was driven out in 1711; and Rouget, who, in virtue of a residence of fifteen years at Marseilles, claimed in 1771 the right of engaging in marine commerce. Since 1808 Marseilles has been the seat of a consistory, whose administrative authority extends over all the Jewish communities of southern France. The Jewish quarter, with its principal street, which was called "Carreria Jusatarie" or "Carreria Judæorum," and its lanes and byways, formed a kind of island designated "Insula Juzatarie," and occupied a considerable area. In 1350 the Jews planned to leave their ghetto, but the inquisitor objected and obliged them to remain. When the city was taken by King Alphonso V. of Aragon, in 1423, the Jews suffered especially, and most of them fled from Marseilles, seeking refuge in various places of Provence. Some returned within a short time, under the protection of a safe-conduct, while the remainderwere enjoined to return within fifteen days, under penalty of furnishing their coreligionists with a sufficient security to guarantee the payment of the communal debt incurred before the disasters of 1423. The Jews had two synagogues in the Middle Ages, one "Scola Major," and the other "Scola Minor." 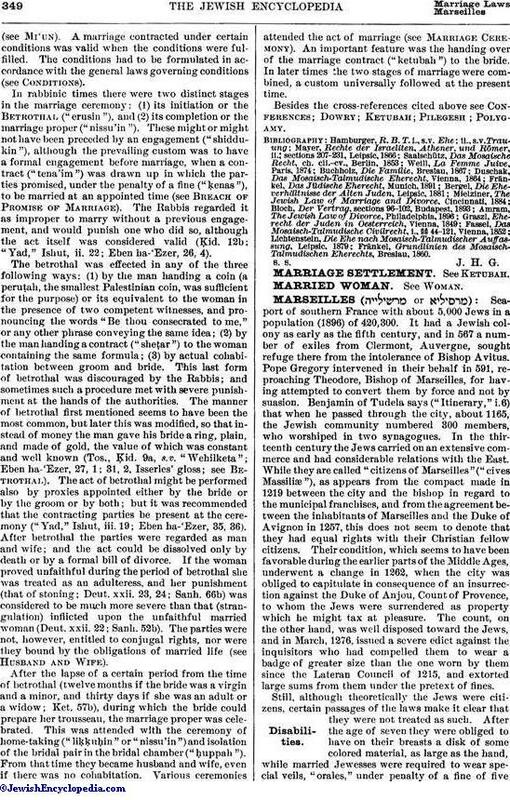 A Latin document mentions a third synagogue in an entirely different quarter. The present temple was built in 1865. In medieval times the Jewish cemetery was situated on the Mont-Juif or Montjusieu, but after the expulsion of the Jews King Charles VIII. presented the site to a citizen of Marseilles. In 1783 Solomon de Silva and Mordecai Ḥay Darmon bought a plot in the Quartier du Rouet. This served as a cemetery for the Jews until 1804, when it no longer sufficed; and a larger piece of land was bought in the vicinity ("R. E. J." xiv. 302). At present (1904) the community of Marseilles owns two cemeteries, one, now closed, near the Place Castellane, and the other in the Quartier de St. Pierre. The hospital was situated in the vicinity of the large synagogue, and the two almshouses were under the supervision of rectors. One of them was called "Saraca." The Jew Bonias Salemas left it in 1426 a bequest of four measures of pure wine annually as a perpetuity; to the other one he bequeathed, in a similar manner, a measure of oil to be delivered every year on the eve of the fast of Kippur. The women's bath, called "Lo Banhador de las Fennas," was also situated in the ghetto. The Jews had their own slaughter-house, called "Lo Masel de los Jusieus." In the second half of the twelfth century Marseilles was an important center for Jewish studies. Benjamin of Tudela styles it "the city of geonim and sages." In 1194 it was to these "scholars and learned men" that Maimonides addressed his letter on astrology (comp. Maimonides, "Iggerot," ed. Amsterdam, p. 6). The following are some of the scholars of Marseilles: twelfth century: Simeon b. Antoli or Anatole and his brother Jacob, Isaac b. Abba Mari, Moses b. Samuel ibn Tibbon; thirteenth century: Jacob b. Machir (called also Profatius Judæus), ShemṬob b. Isaac, Joseph of Marseilles, Solomon Nasi b. Isaac Cayl, Jonathan, Isaac of Marseilles, Samuel b. Judah or Meles Bonjudas; fourteenth century: Solomon b. Joseph, Nissim b. Moses, Shem-Ṭob Falcon, and Joseph b. Johanan; fifteenth century: Judah b. David (called also Maestre Bonjudas Bondavi), and Jacob b. David Provençal. Of the modern rabbis may be noted Jonas Weyl (d. 1903) and his successor, the present (1904) incumbent, Honel Meiss. Shebeṭ Yehudah, ed. Hanover, p. 114.